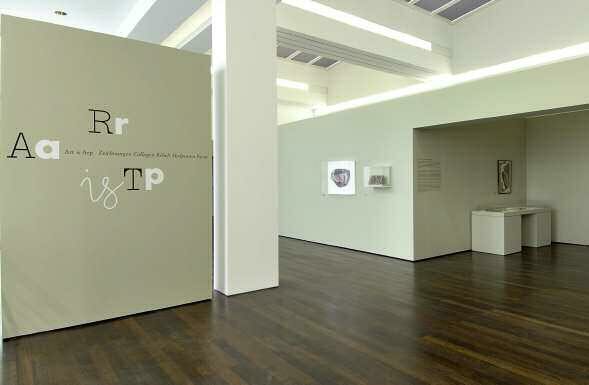 "For Arp, art is Arp" - this proclamation made by Marcel Duchamp in 1949 arouses a curiosity to get to know Arp's understanding of art, presented at the exhibition in the Arp Museum Bahnhof Rolandseck*. There are many reasons to consider the painter, sculptor, and poet Hans (Jean) Arp (1886-1966) to be among the most influential artists of the 20th century. In Zurich in 1916, together with his artist colleagues Hugo Ball, Richard Huelsenbeck, and Tristan Tzara he founded Dada, a protest movement against war and human despotism. With mostly provocative, sometimes playfully-ironic artistic means of expression, the Dadaists tried to surmount existing social and aesthetic norms, and in doing so, revolutionized the art scene in only a short time. "Happenings" and "performances", significant forms of expression even in today's art, are directly rooted in Dadaism, and "concrete poetry" is wholly in the tradition of the poet Arp as well. * Germany's only "museum with a railway connection','having opened in 2007, poses an unusual combination of a classicist 19th-century railway station with the new, avant-garde building by American star architect Richard Meier on a hill above the Rhine. A museum complex that is not only unique for its idyllic location on the Rhine and its view to the beautiful silhouette of the Siebengebirge range of hills, but also for the diversity of all the things it has to offer. In addition to superb exhibitions, the program includes concerts with famous musicians and excellent literary events. 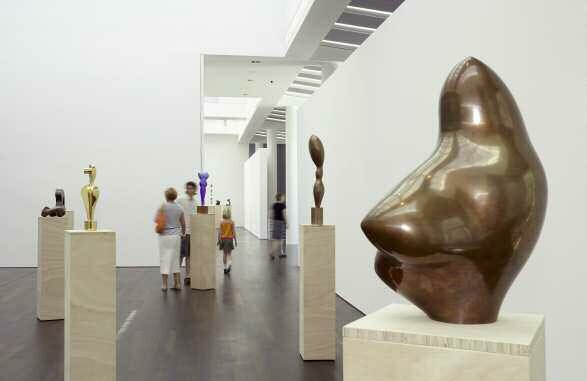 The connection of the three units consisting of railway station, pavilion, and new building present a forum for showing works by Hans Arp and Sophie Taeuber-Arp, for whom the museum is named, as well as internationally-recognized contemporary artists. 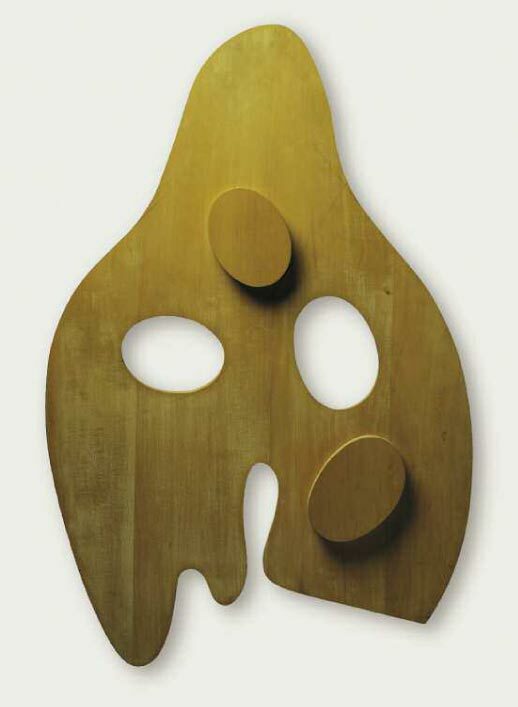 What is more, Hans Arp is recognized as being the pioneer of organic abstraction, which is oriented to the metamorphosis, the constant processes of birth and change in nature — something he made the "measure of all things". 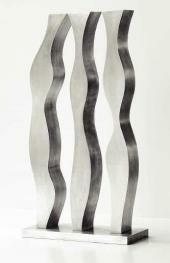 The fluid transformation of forms is something we may witness especially clearly in the three-dimensional sculptures. It is chiefly for this reason that Arp's fully plastic works are considered as being central to his artistic creation. Before Arp ever created his first fully-plastically-sculptured works around 1930 at the age of about 40, however, his characteristic language of forms had already been distinct features in his collages, reliefs, and drawings. This language of forms runs serially throughout the artist's entire oeuvre. The transitions between the techniques, be they in his artworks or in his poetry, are fluid. Often he circles around motifs, coming back to original ideas years later. Because of this, his oeuvre seems to be an entity unto itself, though at the same time it surprises us by its many facets. At the onset of the 20th century tendencies became visible that liberated art from the predetermined social and aesthetic purposes of previous centuries. This development went hand-in-hand with processes of reduction, which among other things resulted in the autonomous treatment of form and colour and a complete liberation from concrete objectivity. Also the young Arp rejected the traditional teaching methods in Strasbourg, Paris, and Weimar and largely detached himself from academic techniques. A period when he lived in reclusion in Weggis, near Lucerne and allowed himself to be led by nature turned out to be just as decisive for his development as was his intensive contact with the avant-garde. In 1912, he got in touch with Kandinsky and the "Blaue Reiter" (Blue Rider group) in Munich and with Herwarth Walden's gallery Der Sturm in Berlin, while being in contact with the Paris avant-garde at the same time. The break with illustrative depiction coincided with the use of simple and unconventional materials. Together with Sophie Taueber, whom he met in 1915 and who later became his wife, a time began of intensely studying geometric forms and horizontal and vertical structures. Both saw in this a possibility for liberating their works from any artistic hand in a traditional sense, in order to create an art that was, for the most part, anonymous. His rejection of traditional oil painting and everything it stood for — a civilization run by a human overestimation and thirst for power that led to war — also manifested itself in new means of expression such as collages, and multi-layered, screwed wood reliefs. By using textile materials, the border between art and crafts had become blurred. His creations, with no relationship to external reality, were now constructions of lines, surfaces, forms, and colours. Since his Dada days, Arp had been trying to play down the role of the artist by beginning to more or less exclude any control of his art. In many of his pen-and-ink drawings he allows himself to be led by his inner feeling: The course of the lines is spontaneous, automatic, and reminds us of natural forms. Also his coloured wood reliefs, which he designated as "earthly forms" may be seen as "contractions" for nature. With his collages Arp for the most part dispensed with intentional composition. He declared chance to be the principle of his creations. The "laws of chance" and the subconscious thus came to replace composition. Closely related to this were the constellation reliefs dating from the beginning of the 1930s, which came about by arranging variations of elements that were formally the same. He took his inspiration from the natural constellations of stars, clouds, and stones. He proclaimed the lively oval, perceived as a "cosmic form" to be a basic formal element. "Arpoetique" is a word coined by the artist Camille Bryen, that makes clear Arp's close ties to poetry. Already in 1903 he published his first poems, and later his texts were published in magazines and anthologies. Arp left his mark on dadaist, surrealist, and concrete poetry, writing both in German and later, increasingly, in French. His gift for poetry was also revealed in illustrations for texts by Richard Huelsenbeck, Tristan Tzara, Benjamin Peret, and Ivan Goll. For his own texts, Arp frequently chose a random concoction of words over the logic of the contents. Text collages came about — detached from any syntax — where he returned to the primal power of the word and its sound. In this way, he criticized the instrumentalization of language by politics and journalism. As with his other art, for these texts there are no statements describing their content or meaning. Influenced by the Surrealists in Paris, Arp developed a completely new, unmistakable repertory of forms between 1920 and 1929, one that would prove to be unique for the language of forms in modern art: the "Object Language". In this language man, nature, and things are all on the same level. They are crossed with or take on characteristics of the respective other things: Objects become "human", humans become "things". At once humorous and critical, Arp managed to convey that man is no longer "the measure of all things" that he had declared himself to be since Renaissance times. Symbolically, objects or bodies have been reduced to their most basic elementary forms, which most of the time float freely before a frameless background. Following the model of medieval "cathedral builders", Arp demanded an anonymous and collective creative process. He placed special emphasis upon working jointly with artist friends, in which the cooperation with Sophie Taeuber was the most intensive and productive. With their collages, drawings, and sculptures, all traces of individual expression have been removed. 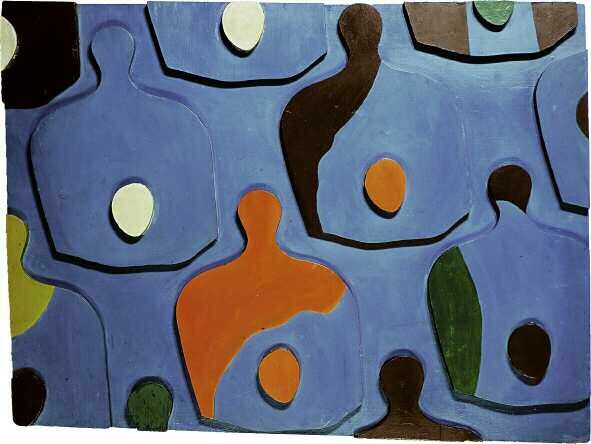 In conjunction with Max Ernst, Arp made pictures and text collages around 1920 called Fatagaga, "FAbrication de TAbleaux GAsometriques GArantis". Around 1937 Arp took part in the Cadavres Exquis. For this surrealist game, Arp, Sophie Taeuber, Marcel Jean, Oscar Dominguez and Raoul Hausmann cooperated on drawings, folding the paper in such a manner that each respective contribution would first remain hidden from the other players. Between 1941 and 1942, during his exile in Grasse in the south of France, together with Sonia Delaunay and Alberto Magnelli, he created a collection of ten pencil and gouache drawings. All of the artists took turns working on the same page. 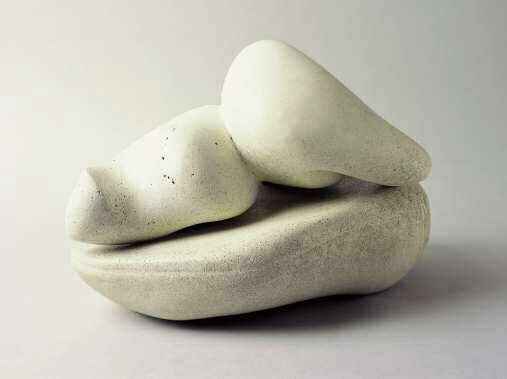 The distancing from a traditional aesthetic understanding of art was not an end in itself for Hans Arp and Sophie Taeuber, but rather the prerequisite for a new, structured, and clearly artistic language of forms, which prevailed in the midst of the chaos of war and on the search for a new balance. The desire to construct found its correlation in the use of the square, the rectangle, and the orthogonal grid in the collages. Between 1926 and 1928, according to plans by Sophie Taeuber-Arp, Hans Arp, and Theo van Doesburg (the founder of the Dutch group of artists "De Stijl"), a remodeling of the "Aubette" took place in Strasbourg, converting it into an amusement complex with a bar and dance hall. In a unique synthesis of painting and architecture, the "Aubette" was one of the first avant-garde "Gesamtkunstwerke", overall works of art. With the exception of "Caveau-dancing" and "Bar Americain", both of which expressed Arp's biomorphic vocabulary, all of the other rooms were in keeping with constructivist aesthetics. The monumental compositions of the three artists had the goal above all to make colour and light exert an effect upon the viewer. At the beginning of the 1930s Arp discovered that some of his collages stored in the attic had been damaged. This made him aware of the fact that all work is transient, subject to decay and death. It was a realization that caused him to doubt the modernistic utopia of a perfect world. In order to integrate this irreversible process in his works, Arp used old collages, etchings, and drawings (his own or those of artist friends). By tearing them up and scattering them upon an initially neutral-coloured ground covered with paste, the result was the "papiers dechires" ("torn papers"). 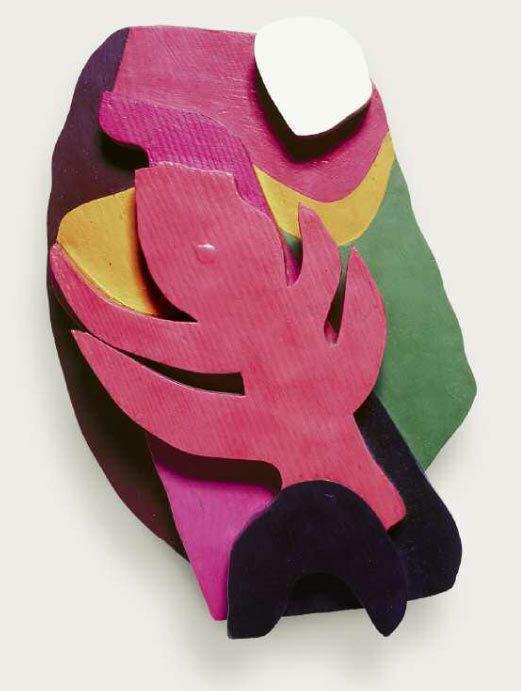 Only chance and the subconscious were initially responsible for the spontaneous order, but Arp sometimes influenced the works by subsequently shifting certain individual paper scraps. Thus, on the basis of destruction, new works came about in a creative process. In his conception of himself as an artist, Arp did not follow any predetermined plan: on the one hand, he used his own hands in order to tear paper and form plaster; on the other hand he created distance to the authorship of the artist by placing the execution and painting of his reliefs as well as the carrying out of his sculptural works into the hands of a third party. It is fundamental that Arp did not allot his own handmade execution the same importance many of his artist colleagues did. The various approaches — the "close" and the "distant" hand of the artist — became apparent above all in the area of the sculptures, which have occupied a central position in his work since around 1930. Arp preferred plaster — for the most part, a neutral material that is easy to work with. 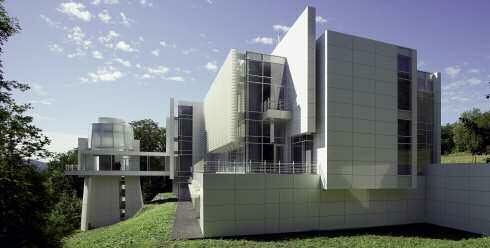 He took advantage of its formability to attain smooth and even contours. Surfaces were sometimes worked over subsequently, and he made use of easily adding or removing forms. Frequently, Arp instructed his assistants to make casts of his own plaster sculptures. These were used in order to make a supposedly finished sculpture the departure point for a new sculpture. Sometimes he divided them into several segments, which he combined anew, and other times he cut a form out of them. These fragments sometimes became individual sculptures on their own: for example, out of "Ptolemy" came both "Daphne" and the "Umriss eines Lebens" (Outline of a Life). Likewise, Arp devoted great attention to the changed relationships of size and the use of various materials (wood, bronze, marble, limestone, granite, and aluminium). 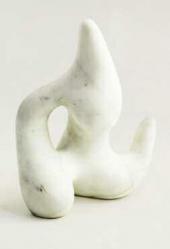 In the production of these sculptures as well, Arp used assistants. In 1953, for example, Antoine Poncet enlarged the sculpture "Gnomenform" (Gnome Form), 39 cm high, to a monumental plaster sculpture 320 cm high, which now bore the title "Wolkenhirt" (Shepherd of Clouds). For Arp it was an integral component of his process of creation to vary the way his own works were executed. As with his sculptures, often two, or even three reliefs result, sometimes over a period of several years and with or without variations. 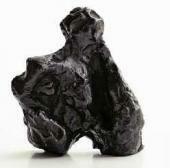 In his sculptures, Arp's modern relationship to nature becomes obvious. In place of the age-old desire to "depict" nature, there was now a desire to "form" in a manner analogous to nature and natural processes. Arp reacted to this problem by referring to his art as "concrete" and no longer "abstract" from 1931 on. Abstract art departs from something (an object, a person, or nature), which is then abstracted. By contrast, concrete art comes about independent of any model. 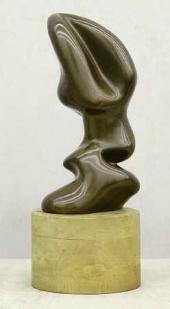 Arp's oeuvre may not be limited to any one definition, one style, or one technique, and thus denies any one-dimensional or overall interpretation. Accordingly, the exhibition foregoes any strictly chronological order in order to concentrate on the inner logic of the works. With the aid of 115 works and over 80 documents, catalogues, illustrated books, and photographs a panorama develops from around 60 years of artistic creation, leading the visitor to the very heart of Hans Arp's art. Denise Rene, Arp ist Art, in: Hans Arp. Eine Ubersicht. Arbeiten aus den Jahren 1912-1965, Exhibition Catalogue Museum Worth, Kunzelsau, 1994, p. 25. Translation from the German by Elizabeth Yolk. Wood Relief. 96 × 62 × 5 cm. Fondazione Marguerite Arp, Locarno.